timetotrade can be used to create Volume Alerts that will execute trades, or notify you, by mobile phone or email when your volume chart conditions are met. You can create alerts that will execute trades if the volume rises above a level or falls a level; combine volume if other indicators such as RSI or price crossing a moving average for volume lead trading strategies. After creating your alerts, you can then quickly backtest your alert based trading strategies. If you're away from your computer, timetotrade will watch the markets for you. 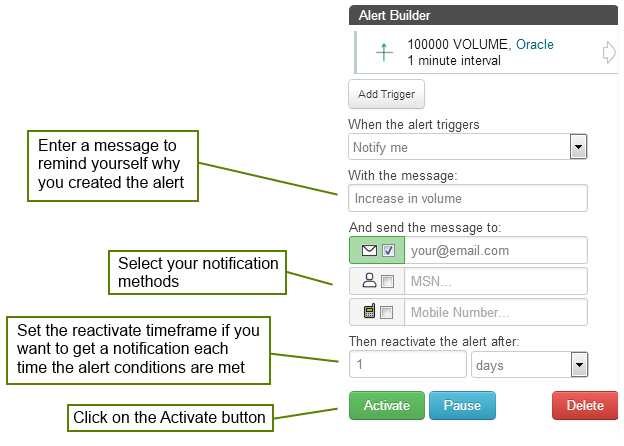 As soon as your alert conditions are met this will trigger an email or SMS text alert to be sent to your pc or mobile phone. Create and customise your own alerts against over 100+ technical indicators. Or create alerts for custom indicators. Simple, intuitive "point and click" system - no programming required. You can even build compound multi-condition alerts which will be triggered if a series of events occurs, for example you could create an alert on a stock that will trigger if: the MACD rises above zero and then crosses over; or the stochastic rises above 80 and the MACD falls below the smoothed MACD; or the RSI of a stock was to fall below 70, followed by a price pull back and a stochastic crossover. The volume figure on shares relates to the number of shares that are transacted over a given period of time. With regards to Forex the size of the transactions are not known, therefore the volume represents the number of bid / ask top of book ticks i.e. the level of activity within a given interval. To create an alert, go to the Charts page, and enter the ticker symbol for the stock or currency pair you wish to use. This will take you to the alert creation page. Once you have set up a timetotrade account you can use the chart settings to add the Volume indicator. Rising Threshold Alert Trigger, is triggered when the value of the Volume rises above a specified value. 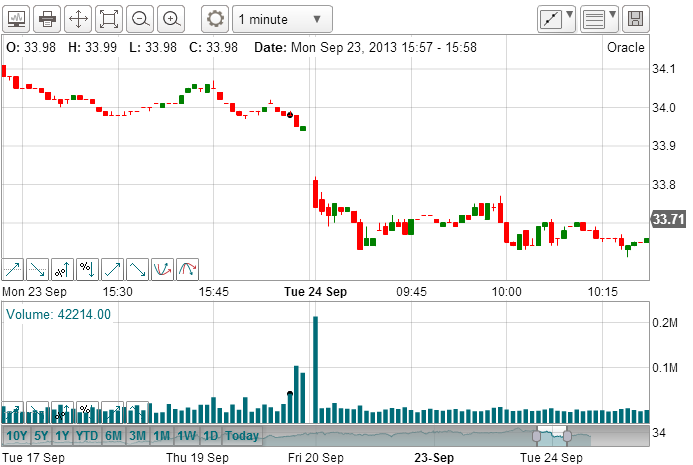 Falling Threshold Alert Trigger, is triggered when the value of the Volume falls below a specified value. Break-Out Alert Trigger, is triggered when the Volume increases by a specified value within a the selected interval period. Pull-Back Alert Trigger, is triggered when the Volume decreases by a specified value within a the selected interval period. Percentage Break-out Alert Trigger, is triggered when the Volume increases by a specified value within a the selected interval period. Percentage Pull-back Alert Trigger, is triggered when the Volume decreases by a specified percentage within a the selected interval period. 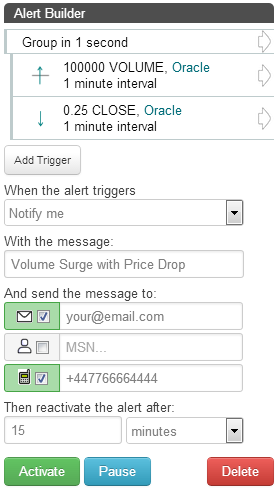 Above Alert Trigger, is triggered when the Volume is above a specified value. Below Alert Trigger, is triggered when the Volume is below a specified value. Positive Crossover Alert Trigger, is triggered when the Volume rises above / crosses over another indicator, price, a specified value or trend line that you have drawn on the chart. Negative Crossover Alert Trigger, is triggered when the Volume falls below / crosses under another indicator, price, a specified value or trend line that you have drawn on the chart. 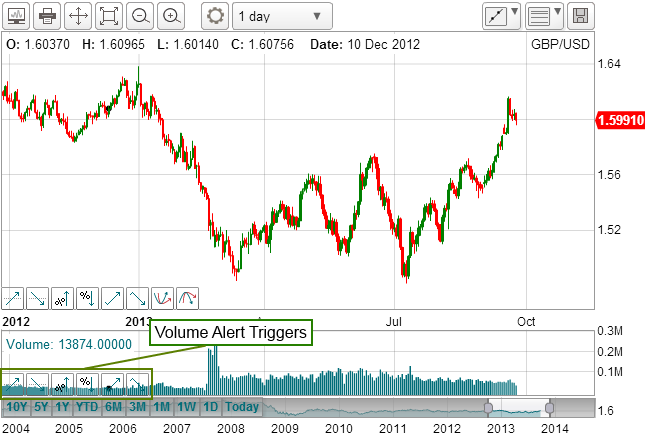 To create an alert, just click on the appropriate Alert Trigger Button at the bottom left hand side of the Volume chart. There are no programming languages to learn, no spreadsheets or complex formulas to write. Just click a button, enter the volume level. Simple! You can use the Alert Threshold Triggers to create an alert to execute trades, or notify you, when these conditions are met in the future. For example, to create an alert that will execute a trade when there is another volume spike, click on the 'Rising Threshold' trigger, then enter a value such as 100000 as illustrated. The other alert triggers such as the "% Breakout" and "% Pullback" Triggers can be used to create an alert to execute trades, or notify you, when the volume increases or decreases by a given percentage within the selected chart interval period. These triggers can be used to execute trades, or notify you, when there is a sudden surge or drop in volume; e.g. you can use Percentage Breakout volume trigger to execute a trade if there is a volume surge greater than 10% within a 15 minute interval. More information on how to use the timetotrade system to create Volume Alerts can be found on the Create Trading Alert page. timetotrade can also be used to create alerts on Price and Volume as well as the technical indicators such as Stochastic, RSI, Bollinger Bands and Moving Averages plus a lot more.